So it is big in the news this week, ROCA, what’s the deal? 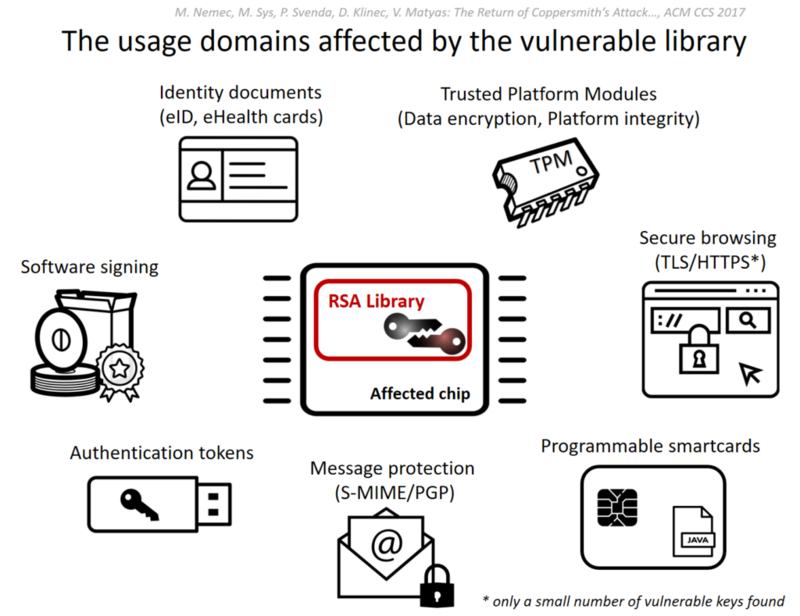 The ROCA vulnerability (tracked as CVE-2017-15361) enables computation of RSA private keys from their public certificate/key counterparts. The flaw affects the implementation of RSA key pair generation by Infineon’s Trusted Platform Module (TPM). It is possible for a range of key lengths, including commonly used 2048 bit and older 1024 bit certificates. Chips as early as 2012 are affected and these are common place in TPM v1.1 modules. A successful computation of a private key allows, depending on its use, the attacker to decrypt sensitive data (eg: file encryption, disk encryption, HTTPS), forging digital signatures (used for email security, and file signing), or even impersonation and identity theft from (access control cards to e-ID cards). Major vendors including Microsoft, Google, HP, Lenovo, Fujitsu already released the software updates and guidelines for a mitigation. The ‘The Return of Coppersmith’s Attack: Practical Factorization of Widely Used RSA Moduli’ (ROCA) research paper will be released at ACM CCS in 2 weeks time.